January can be tough month on a person's psyche. The holidays are over, the New Year resolutions can be hard (I'm in the middle of a Whole30 right now), and the weather can be downright cold and gloomy. Two things you can do to lift your spirits: 1) force paperwhite bulbs indoors (mine just bloomed today!) and 2) grow sprouts. Really, it's not all that surprising that these solutions are plant-related because it's usually around January that I start to miss my garden -- especially the fresh produce that comes out of it. But one way I get fresh, homegrown produce in the middle of my cold, Utah winter is to grow sprouts in my kitchen. Yep, that's it. Once you've got the supplies, all that's left is some water and a wait of a few days before you have fresh, nutritious sprouts (you can find a list of their health benefits here). 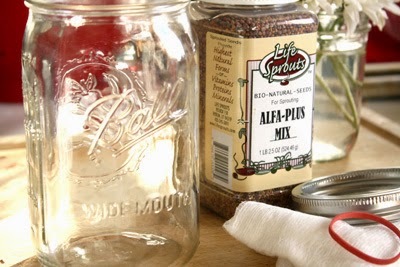 Step 1: Pour two tablespoons of seeds in the glass jar. 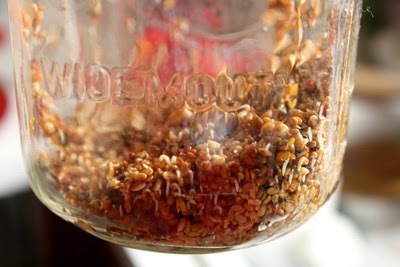 Fill jar with enough warm water to cover the seeds then add an inch or two of more water. Cut a square of cheesecloth big enough to cover the mouth of your jar. You may have to layer the cheesecloth a couple times depending on the thickness of the cloth you're using. Secure in place with the rubber band and screw on the ring. If you're going to use a sprouting lid, skip the cheesecloth, rubber band, and ring -- just put the sprouting lid on the jar (sprouting lids are inexpensive -- I got mine for less than $2 at my local natural foods store, but you can find them online, too. 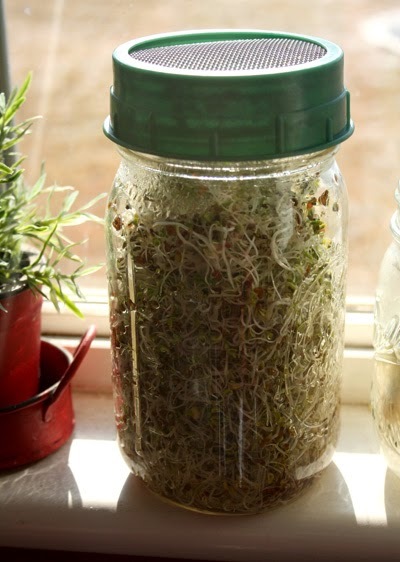 If you're going to grow sprouts regularly, I would highly recommend getting a sprouting lid. You'll see mine in some of the pictures below.). Step 2: Let the seeds soak for about 12 hours in a dark place. When I grow mine, I put them in a kitchen cupboard that isn't used as often as some of the others. Quick note: you're going to be rinsing and draining your sprouts in 12-hour increments, so I'd suggest starting your seeds at a time that makes sense. For example, the first time I grew my sprouts, I didn't read ahead and I started soaking my seeds around noon, only to realize later that would mean draining them at midnight. Oops. Step 3: After the 12-hour soak, drain the water from the jar. 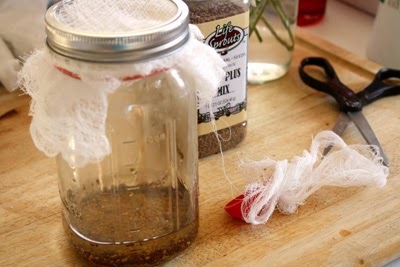 You do not need to remove the cheesecloth or sprouting lid to do this. Rinse the seeds (nothing fancy -- fill the jar with water, swish the water around). Drain the water without removing the cheesecloth or lid. Put the jar back in a dark place for another 12 hours. Step 4: Rinse and drain again. You should see little sprouts popping out of the seeds. (Aren't they cute?) Once you've rinsed and drained the seeds, put them back in the dark. Step 5: Rinse and drain sprouts every 12 hours until they reach the length you want. Step 6: Once they've reached the length you want (it took about 3-4 days to get to the length in this picture), put the jar in sunlight. This will help them develop green leaves (This mostly applies to small sprouts like alfalfa, radish, and clover; larger bean sprouts, like mung bean sprouts, are not placed in the sunlight for greening). Step 7: Once the sprouts have greened, empty them into a colander and rinse thoroughly. Spread the rinsed sprouts on a dishtowel to absorb the excess water. And ta-da! Homegrown sprouts! It truly is gardening without soil, food grown in just a matter of days. Even after two years of growing sprouts at home, it still amazes me. 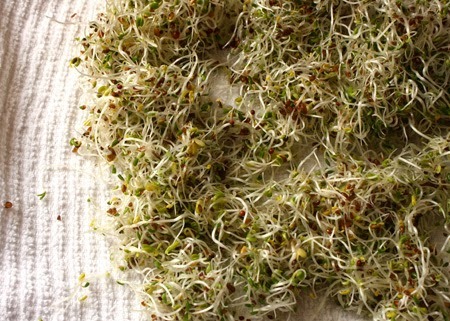 Be sure to store your sprouts in an airtight container in the refrigerator. They should last about a week. It's a good idea to rinse them from time to time so they don't get all gross and slimy. My family mostly enjoys sprouts on sandwiches and salads (though my son, no joke, put them on pizza once when he was around six years old -- he loves them!). I love how fresh they taste and how just a simple handful of them can liven up a dish. Homegrown greens in the wintertime? Always welcome. Mmm.. 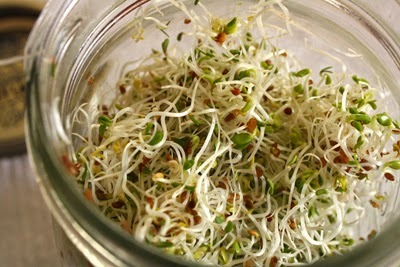 I love sprouts and they are so easy to grow! Great tutorial. Ive done this and they come out good! It is so hard to get fresh sprouts at the store and they go bad so quickly! I agree! They are so easy. Of course, I cannot remember the last time I grew sprouts. Thanks for the reminder. This would be such a fun thing to try with the kids! Wow you are really ambitious! 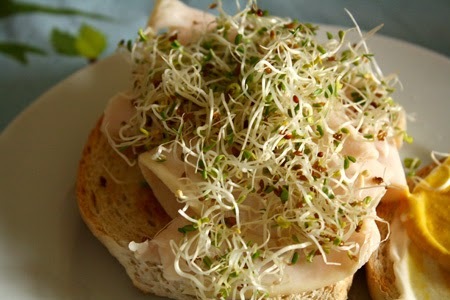 This looks awesome, I love adding sprouts to salads and sandwiches. I'll have to give this a go sometime. I have grown sprouts before. It is really fun since it is instant garden satisfaction. I used to sprout my beans before cooking them. Lentils are so cool when sprouted. My kids would love this. I can never find organic sprouts at the store. I love that you worked in a sprout factory. So cool. Thanks for sharing this simple step-by-step tutorial. Sprouts are not only fun, they are equally healthy and easy to prepare. Of course no specific time to have them since one can have them at any point of the day.